Instead of a sprawling vine, these cucumbers are produced on compact, bushy plants. Especially good for small gardens or containers, the plants measure only 3 feet in diameter at maturity. A second planting is early summer is recommended for a fall harvest. Pick fruit often and for best flavor do not permit them to grow too large. Control insects with vegetable dust. Seed spacing - 3-5 seeds in a ring about 2 inches across. 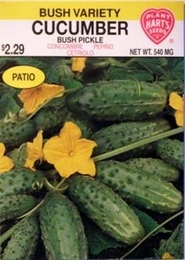 Bulk Pickling Cucumber seed available.